A Voltphreaks battery has an extremely long service life, lasting much longer than a comparable lead-acid battery, which helps to offset the higher initial cost of a lithium battery versus a lead-acid battery. For example, a typical lead-acid battery can be charged and discharged 300 times, after which the battery must be replaced. A Voltphreaks battery can be charged and discharged over 2000 times! After 2000 charge/discharge cycles, capacity and power will be reduced, but the battery can still continue to be used. Typically, you can expect a Voltphreaks battery to last 3 to 4 times as long as the lead-acid battery it's replacing, and 5-10 years or more. 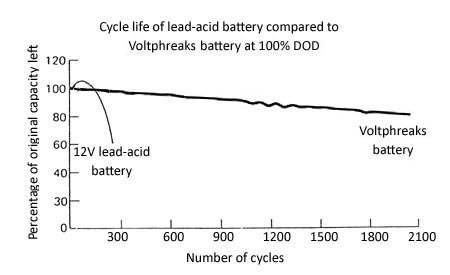 The chart below shows the cycle life at 100% DOD (depth of discharge), meaning how many times the battery can be discharged to empty and charged to full. A lithium battery's cells will drift out of balance over time, and this will shorten life. All Voltphreaks lithium batteries have a built in balancing circuitry.